Numismatic Notes and Monographs is devoted to essays and treatises on subjects relating to coins, paper money, medals and decorations and is uniform with Hispanic Notes and Monographs published by the Hispanic Society of America, and with Indian Notes and Monographs issued by the Museum of the American Indian—Heye Foundation. rudisill and smith company, lancaster, pa., u. s. a. When the exhibition of the early coinages which circulated in America was planned by The American Numismatic Society for the spring of 1942, a photographic reproduction of seventeenth century coins came to light in searching for material. This was in a passe-partout frame bearing a caption stating that the coins depicted were selected from the deposit found at Castine, Maine, in 1840; on the back there was a note that the reproduction had been presented to the Society by one of its Benefactors, Mr. Daniel Parish, Jr., in 1883. Correspondence ultimately established that this find of coins had been published by the Maine Historical Society in 1859 and that the coins in our illustration had since become the property of that Society and were to be seen in their quarters in Portland. A request that they be loaned for our exhibition, made to the President, Mr. Walter G. Davis, was courteously granted and the data regarding them in the Society's possession was placed at our disposal by Miss Mae Gilman, the Librarian of the Maine Historical Society. When the coins were received they were found to have such pertinence for our purposes that permission for their further study and for their re-publication was sought and obtained. This monograph is the result. 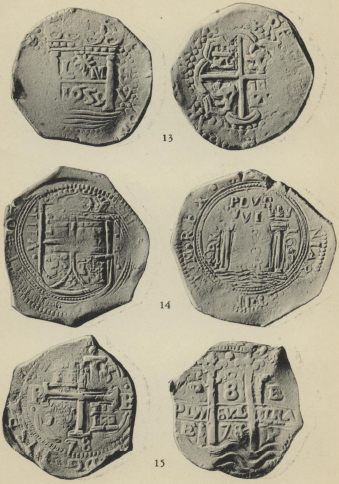 "It was not on the peninsula that these coins were found, nor within the limits of the town of Castine, but on the banks or shore of the Bagaduce river, about six miles from the site of Castin's fort, in the town of Penobscot. This river, at its mouth, forms the harbor of Castine, and is navigable for small vessels for several miles above the village. At about six miles above, is a point called Johnson's Narrows', or 'Second Narrows', where the water is of great depth, and at certain periods of the tide forms a rapid current. A path leads across the point, and from the adaptation of the shore as a landing place, it is probable that the usual passage from Biguatus to Mt. Desert, was up this river as far as the narrows. Near the narrows the coins were discovered. "The first indication of the hidden coins was perceived at the close of one of the last days in November, 1840, by Captain Stephen Grindle, on the farm he owned and occupied at the Second Narrows, before described. While engaged with his son, Samuel Grindle, in hauling wood down the bank to the shore, the latter picked up a piece of money near a rock which was partially buried in the ground. The rock was on a side hill, and when uncovered, presented an irregular surface of about four square feet. Its situation was some twenty-five yards from the shore, and in the direct line of a beaten track through the bushes, which has been used as a path across the point for a time beyond the remembrance of the oldest inhabitants. At the termination of this path on the shore, is an indentation or landing place, well adapted for canoes, and the natural features and facilities of the spot are confirmatory of a tradition that one of the Indian routes from the peninsula to Mount Desert and Frenchman's Bay was up the Bagaduce river, and from thence across to Bluehill Bay. The land was very rocky, and covered with a second growth of trees; the original growth having been cut about seventy-five years. At the time the coins were found, Capt. Grindle, together with his father-in-law, Mr. Johnson, had resided on the farm for over sixty years. Portions of the top of the rock were embedded in the soil to the depth of a foot, and a clump of alders grew around. The appearance of the place is not now the same as when the discovery was made. Repeated digging has laid the rock bare to the depth of several feet, and the side hill has washed away. "Upon finding the first coin, which proved to be a French crown, Capt. Grindle and his son commenced digging away the earth around the rock, and by the time it was dark, had possessed themselves of eight- een or twenty additional pieces. They then abandoned the search, intending to renew it on the following day. That night a severe snow storm occurred, which covered the ground, and rendered further investigations during the winter impracticable. Early in the spring they resumed the examination. On the top of the rock, embedded in the mass, one or two coins were found, and upon striking a crowbar in the declivity, and grubbing up the alders, they came upon a large deposit, numbering some four or five hundred pieces of the currency of France, Spain, Spanish America, Portugal, Holland, England, and Massachusetts. . . . The greater part of the money was found contiguous to the rock, but many pieces were afterwards exhumed ten or twelve feet distant. 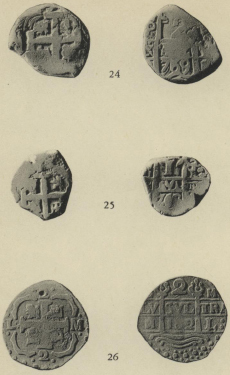 As several of the smaller coins appeared to be scattered down the declivity, it was probable that they were washed away by the action of the elements. No vessel or covering, or remains of any, were found in connection with the coins. Appearances indicated that the deposit was originally made at the side of, or perhaps on the rock, without any protection except a perishable one. 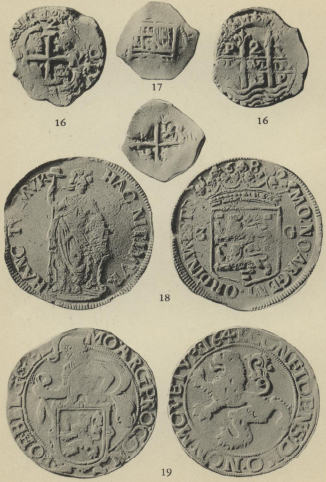 Many of the coins retained their original brilliancy, but some were blackened and discolored by exposure to the weather. Dr. Joseph L. Stevens, 1 of Castine, visited the spot early in April, 1841, while Capt. Grindle was still engaged in searching the ground, and several coins were dug up in his presence. An opportunity was afforded him to examine at his leisure the entire collection, before the owner had disposed of any portion, and to select the most perfect specimens of each variety which could be found. These, seventeen in number, he paid for at the rate of old silver. Other gentlemen secured similar samples; but Dr. Stevens' collection is the most complete that has been preserved. Most of the coins were paid to a creditor of Capt. Grindle, and ultimately found their way into the crucible of a silversmith. The exact amount which their fortunate discoverer realized probably exceeded five hundred dollars. No other money has ever since been discovered at Johnson's Point, but the extent of numerous excavations in its vicinity indicate that the neighboring inhabitants believe that additional treasures are yet concealed." A subsequent account of the find is given in George Augustus Wheeler's History of Castine, Penobscot and Brooksville, Maine ,† published in Bangor in 1875. This statement is said to be "mainly that of Dr. Joseph L. Stevens" and because of its interest, the author "does not hesitate to insert it entire." Since Dr. Stevens was present when some of the coins were found, and since his version differs somewhat from that of Mr. Wheeler, his testimony must be given considerable weight. He refers to the information given in the earlier article and there is mention of the section of the deposit secured by himself and some "friends . . . each of whom purchased a number of coins." "The writer (Dr. Stevens) selected as nearly as he could, a specimen of each (variety), nineteen in number. There must have been in all nearly, if not quite, two thousand pieces, but a large proportion of them were only small fractions of crowns and dollars. The French money largely predominated; next, the old Spanish "cob" dollars. . . . There were quite a number of Belgic and Portuguese coins. The most interesting of all were the Massachusetts pine-tree shillings and six-pences, all of date 1652, and in number about twenty-five or thirty. I saw but two English coins, shillings—worn nearly smooth." The most marked divergence in the two accounts is in the number of coins the deposit is said to have contained—four to five hundred in the earlier account; "nearly if not quite two thousand pieces" in that of Dr. Stevens. The next in importance of the differences is in the number of the Pine Tree issues—in the earlier record there are stated to have been fifty to seventy-five shillings and nearly as many six-pences, while Dr. Stevens gives a total for both denominations as from twenty-five to thirty. There is also disagreement regarding the number of "Belgic" and Portuguese pieces found. There is one further discrepancy to which attention should be directed before we proceed to a description of the coins, and that involves the number selected by Dr. Stevens. The account published in 1859 gives the number as seventeen, Mr. Wheeler's statement, which quotes Dr. Stevens, says nineteen, while the photograph dated before 1883 in the possession of the American Numismatic Society shows eighteen and the frame loaned for our exhibition contains nineteen. Checking discloses that the piece we have numbered 26 in the list which follows is not in the 1883 photograph. We also find that No. 24 is a piece which bears the date of 1769—a condition which obviously justifies its rejection as an addition or interpolation. The rejection is further warranted in that all of the Spanish-American issues were lumped by both Mr. Williamson and Dr. Stevens as 'cobs' without further distinction. The worn condition of No. 24 is such that it may later have been accepted as part of the original hoard without critical examination. A similar condition must account for No. 25. This brings the total number of coins back to the figure with which we started—that is, seventeen. 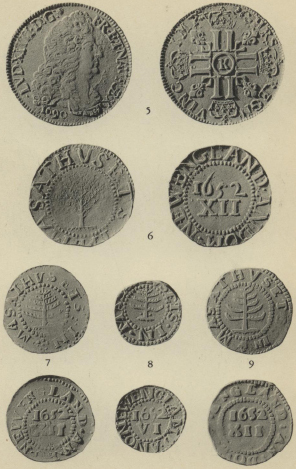 In addition to the seventeen coins originally selected by Dr. Stevens, plus the two which have been rejected, there were seven other coins loaned by the Maine Historical Society as possibly forming a part of the original Castine deposit. One of these (No. 25) must be rejected because of its date, 1768. This test is safely passed by each of the others, and they are included in the catalogue which follows, being Nos. 3, 8, 9, 10, 11, 23, and further distinguished by an asterisk to indicate that they are not part of Dr. Stevens' selection. These were presented to the Maine Historical Society by the Hon. Joseph Williamson, the author of the 1859 account of the find. 1. LVDOVICVS•XIII•D•G•FR•ET•NAV•REX Laureate and draped bust of Louis XIII to r.
Rev. •SIT•NOMEN•DOMINI• A (mint-mark for Paris) •BENEDICTVM•1642. Crowned shield bearing the fleur-de-lys of France.
. 27 mm. Louis d'argent de 15 sols (Paris Mint), weighing 103½ grains (6.71 grms.). Hoffmann, Les Monnaies Royales de France, Pl. LXVIII, 89. 2. LVD.XIIII.D•G (star) FR.ET•NAV.REX Youthful bust of Louis XIV, wearing laurel wreath, draped and cuirass with order of St. Esprit, to r.
Rev. Similar to No. 1 save for date, 1652, and rosette at beginning of inscription.
. 40 mm. Écu blanc or d'argent (Paris Mint), weighing 418 grns. (27.09 grms.). Hoffmann, loc. cit., Pl. XCV, 74. 3. * Similar to No. 2 for inscription and type except in minor details. Rev. Similar to No. 2 except for m. m. L (Bayonne), date (1655) and for an added monogram (conjoined L and B†) and cross separating end of inscription from date.
. 32 mm. Demi-écu blanc or Louis d'argent de 30 sols; wt. 205 grns. (13.28 grms. ); Hoffmann, loc. cit., Pl. XCV, 76. 4. LVDOVICVS•XIIII•D•GRA• A rose or rosette precedes the XIIII. Draped bust of Louis XIV to r.; the portrait more mature than in No. 2, and without wreath. Rev. FRAN ET NAVARRE REX 16 76 Beneath a crown, a cross of fleur-de-lys with m. m. D (Lyons) at center.
. 19 mm. Four sols; wt. 25½grns. (1.59 grms. ); Hoffmann, loc. cit., Pl. XCVII 106. 5. •LVD•XIIII•D:G: (Sunburst or Helios head) FR•ET•NAVREX Draped bust of Louis to r.; beneath 1690. The portrait is now mature. Rev. (Crescent) CHRS REGN VINC IMP (Star). Four double-Ls crowned and arranged in form of a cross, with fleur-de-lys in the angles, and letter K (m. m. for Bordeaux) in circle at center.
. 33mm. Demi-écu aux huit livres; wt. 208 grns. (13.48 grms. ); Hoffmann, Pl. XCIX, 134. This piece re-struck over earlier issue—the word BENEDICTUM is discernible on the obverse. This monogram is identified by A. Blanchet in an article on the Bayonne Mint in the Rev. Num. (1913, p. 73) as belonging to Martin de Laborde, a mint master, and Forrer's Biogr. Dict. of Medallists states that he was mint master from 1650 to 1656. 6. MASATHVSETS•IN• The N is inverted. Legend between two circles of dots; at center a pine tree. Rev. NEWENGLAND•ANDOM• Legend between two circles of dots—the outer one off-flan. At the center, in two lines, 1652/XII.
. 29 mm. Mass. shilling; wt. 72 grns. (4.67 grms. ); Crosby 4–F, Wurtzbach 42. 7. MASATHVSETS•IN• The pine tree is high on the die. Rev. NEWENGLAND•ANO• At center, in two lines, 1652/VI.
. 19 mm. Mass. sixpence; wt. 33 grns. (2.14 grms. ); Crosby 1–A. 8. * Inscr. similar to Nos. 6 and 7 except that periods are replaced by 'rosettes'—the first having five dots, the second seven. Branches of tree spreading and slightly curved. Rev. NEWENGLAND•AN•DO• At center, 1652/XII.
. 24 mm. Mass. shilling; wt. 69 grns. (4.46 grms. ); Crosby 15–0. 9. * Similar to No. 8—the first 'rosette' has four dots in a compact cluster; the second is composed of larger dots. Rev. NEW : ENGLAND : AN : DO : At center, 1652/XII.
. 25 mm. Mass. shilling; wt. 68½ grns. (4.44 grms. ); Crosby 14–R. 10. * PHILIPPVS IIII DEI G (Date off-flan). Shield with Spanish coat-of-arms of period. To left, letters O M P.
Rev. HISPANIARVM ET INDIARVM REX (Small cross). Cross quartering arms of Castile and Leon in ornate reserve.
. 35x33 mm. 8 reals; wt. 418½ grns. (27.12 grms. ); Herrera, El Duro, Pl. XIII 10. 11. * Similar to No. 10; both date and mint indications illegible. Rev. Similar to No. 10.
. 37x29 mm. 8 reals; wt. 415½ grns. (26.93 grms. ); Cf. ref. for No. 10. 12. CAROLVS II DEI G (Date off-flan). Shield with coat-of-arms. The mint-mark for Mexico City to 1. with G beneath. Rev. Similar to Nos. 10 and 11.
. 34x34 mm. 8 reals; wt. 418 grns. (27.09 grms. ); Herrera, El Duro, Pl. XIV, 2. No effort is made to give the punctuation on these cob pieces—when visible on the specimens from this hoard, the periods seem to be centered. The inscriptions for these Spanish-American issues (with the exception of No. 15) are supplied from better preserved specimens. 13. PHILIPPVS IIII DEI G (Cross). Above a base of slightly curved lines filling the exergue, two pillars supporting a crown; between the pillars, in two lines, L * M/1659. To r. of columns, 8/V. A dot or pellet above and below the 8 and another beneath the V. Field to 1. of columns not struck up. Rev. HISPANIARVM ET INDIARVM REX Inscription between two circles of heavy dots. Within a reserve whose double outline is not con- tinuous, a plain cross with the arms of Castile and Leon in the quarterings.
. 37 mm. 8 reals; wt. 423.5 grns. (27.44 grms. ); Cf. Herrera, El Duro, Pl. XI, 9. (p. 204, No. 393); and Wayte Raymond, The Silver Dollars of North and South America, p.35, No. 1. 14. PHILIPPVS IIII•D G The stops in the inscription indicated here by periods are, on the coin, in the form of a small cross of five dots. Crowned shield with the arms of Castile, Leon and Granada; in field to 1. and reading upward from center, •VIII. ; to r., cross of five dots as in inscription, between two pellets or periods. Rev. Legend as for No. 13, within a circle of large dots and an inner one of small dots between two linear circles. In center two pillars, each crowned, and resting on basis of curved lines which fill the exergue. In field to 1., P(? )° RM; to r., 1657. Between the pillars in five lines PLVS/VL/TRA/O/NR.
. 44 mm. 8 reals; wt. 418.5 grms. (27.12 grms. ); Cf. Medina, Las Monedas Coloniales Hispano-Americanas, p. 258, 304. 15. CAROLUS D G HISPANIARVM REX Inscription between two circles of dots. Cross quartering the arms of Castile and Leon, with a pomegranate (?) or bud above the topmost arm, 78 beneath the lower arm, the letter P between two dots at the left and the letter E between dots at the right. The linear reserve noted in Nos. 10–12 and in No. 13 is indicated by four double-lined arcs connecting the tips of the arms of the cross. Rev. POTOSI ANO 1678 EL PERV between two circles of dots. Two pillars with ornate trefoil capitals resting on wavy base-lines. The inscription in three lines is separated by two horizontal lines as well as by the pillars vertically—P 8 E/PLV/SVL/TRA/E 78 P. At the top, near the rim and midway between the pillars, the pomegranate as on the obverse.
. 37 mm. 8 reals; wt. 409 grns. (26.50 grms. ); Cf. Medina, loc. cit., p. 228, 247. 16. Similar to No. 15—the inscription terminates with the I of HISPANIARVM; the cross has 2 above the top arm, 83 below the lower arm, an indistinct letter to 1. and the letter V to r.
Rev. Similar to No. 15 save for indication of value and minor details.
. 27 mm. 2 reals; wt. 95.5 grns. (6.19 grms. ); cf. Medina, loc. cit., p. 229, 250. 17. Badly worn, but apparently similar to Nos. 11 and 12. Rev. Worn—the shape of the cross-arm and of the linear reserve similar to those on Nos. 11 and 12.
. 23 mm., 1 (?) real; wt. 53 grns. (3.43 grms. ); cf. Medina, loc. cit., p. 73, 19. 18. HAC NITIMVR HANC TVEMVR Draped female figure, facing, with r. hand holding an upright spear on which is a hat; the 1. arm resting upon a book with two clasps on an ornamental support. Rev. MO: NO: ARGENT• ORDIN. WESTF. 1 6 8 2 Crowned shield bearing two lions passant gardant to the 1.; in field, to 1. 3—to r. G.
. mm. 3 gulden; wt. 481 grns. (31.82 grms. ); Verkade, Muntboek, Pl. 68,1. 19. MO• ARG PRO: CON FOE•BELG• GEL On a shield, supported by a male figure in helmet and armor, a rampant lion to 1. Rev. CONFIDENS•DNO•NON•MOVETVR•1641 As type, rampant lion to 1.
. 41 mm. Leeuwen daalder (lion dollar); wt. 404 grns. (26.19 grms. ); Verkade, Muntboek, Pl. 11, 1. 20. PHILIPPVS• IIII• D G Crowned shield with coat-of-arms used during the latter part of the reign of Philip IV, with escutcheons of pretense for Portugal and Flanders-Tyrol. In field to 1., B and section of aqueduct (mint-mark for Segovia); in field to r., IIII. Rev. HISPANIARVM • REX • 1659 • Within an outer linear border and an inner one of dots, the arms of Castile and Leon in the quarterings of a cross having thin linear arms—the whole within a reserve having a double-lined border. In the upper 1. field, a countermark: a crowned rectangle enclosing the figures 300.
. 36 mm. 4 reals; wt. 195 grns. (12.64 grms. ); Herrera, El Duro, Pl. VI, 5. For counter-mark, Ann. Primeiro Congresso de Num. Brasiliera, Vol. I, p. 409. 21. IOANNES•IIII•D•G•REX•PORTVGALIE Crowned shield bearing the arms of Portugal between two annulets. Rev. IN•HOC•SIGNO•VINCES.:. Cross of St. George with letter P (mint-mark for Oporto) in each of the angles.
. 26 mm., Tostão; wt. 86.5 grns. (4.60 grms. ); Aragao, Descripção . . das Moedas . . de Portugal, II, Pl. XXXII, 23. 22. •CAROLVSD : G : MAG : BRI : FR : ET HIB : REX• (Mint-mark, triangle in circle—used during period 1641–43). Crowned bust of Charles I to 1. within dotted circle; in r. field, XII. Rev. CHRISTO AVSPICE REGNO (Mint-mark as on obv.) Within a dotted circle, a square plain shield over a cross fleury, with coat-of-arms of Charles.
. 30 mm. Shilling; wt. 86.5 grns. (4.60 grms. ); Hawkins, Silver Coins of England, p. 343, cf. Pl. XLIV, 517. 23. * IOHAN•FRIED•D•G•DUX•BR•ET LUN (rosette). Rearing horse to 1., with 12 beneath. Rev. F•BR•LUN•LANDT•M•V•F•SILBER• (rosette). At the center, *XII*/MARIEN/GROSCH/1671./* (rosette)*.
. 30 mm. 12 Mariengroschen of fine silver; wt. 110 grns. (7.13 grms. ); Fiala, Münzen und Med. der Weifischen Lande: Das Neue Haus Lüneburg (Celle) zu Hannover, p. 311, 1894. 24. Badly worn piece; only the cross of the type of Nos. 15 and 16 discernible, with traces of the quarterings. Rev. Compare with No. 16—the pillars, the letter P at the upper right and the date 769 at the center of the lower line are decipherable, as is the 2 indicative of its value in the first line.
. 22 mm. 2 reals; wt. 98.6 grns. (6.36 grms. ); cf. Cat. Manuel Vidal Quadras y Ramon, Vol. III, 10230, Pl. 67a, 8. 25. Similar to No. 24. Rev. The I indicating its value, and the letter P(?) and a P reversed are visible in the first line; at the center is SVL, and in the line beneath 768—the last digit not certain.
. 19 |mm. 1 real; wt. 47 grns. (3.05 grms. ); cf. ref. for No. 24. 26. Cross crudely similar to those of Nos. 24 and 25, and with crude segments like those of Nos. 15 and 16. The quarterings are reversed—i.e., they have the lion of Leon at the upper right instead of the castle for Castile. Above the upper cross-arm, and below the lower one, •2• to indicate the value. To left, the letter L with periods above and below; similarly to r., M. The whole in a circle of heavy dots. Rev. Similar in form to No. 16. The inscription reads L 2 M/PLV SVL TRA/M 182 L. A circle of heavy dots is indicated beneath the wave-lines—possibly a double circle.
. 25 mm., imitation of 2–real piece, wt. 49.5 grns. (3.21 grms.). For the Lima issues imitated, see Medina, loc. cit., pp. 181 ff. Cf. also Cat. of the Coll. of Julius Guttag, p. 443, note, for statement of what little is known regarding these imitations. It is apparent that any assignment of a date for the burial of the deposit must be governed by the coins found. If the coins had been without dates, we should have had to rely on the relative wear shown by the coins in the hoard; those without signs of circulation would have been considered the latest. But most of the pieces selected by Dr. Stevens have perfectly legible dates, with the exception of the Mexican pieces-of-eight. 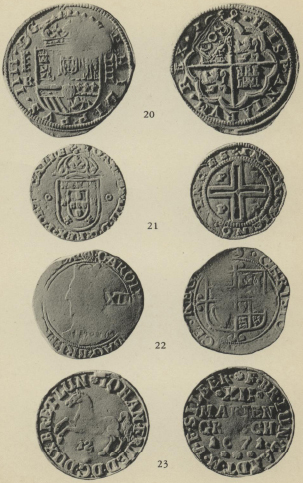 These, however, bear the names of the Spanish rulers during whose reigns they were minted, and also initials of the mint-masters by whom they were struck, which sometimes serve as aids in identification as well as providing some indications of chronology. These initials are usually to be found below the letters which indicate that the coins were struck at Mexico City—a second letter is sometimes found to the right of the shield which serves as type. In the present instance, two are attributable to Philip IV and one to Carolus II, who reigned from 1665–1700. It is therefore barely possible that our No. 12 may not have been struck before 1700, though the chances would make that seem highly improbable. The date for the mint-master whose initials occur on this piece is given in Pradeau's list† as 1674. The latest discernible date for a coin in the deposit is 1690 (No. 5). This is clearly to be read on a demi-écu struck at the Bordeaux mint in that year. The coin, in contrast to the Mexican piece, is in fine condition and with only slight signs of circulation. If we are to consider this as the latest piece in the find, we must allow a reasonable time for its voyage to the New World—at the very least a full year and more, probably several years. In the study of hoards, the site on which they are found is frequently of great significance, and we should expect this condition for the Castine coins. We must therefore look into some of the facts which the accounts already cited assume as common knowledge. A trading post was established here in 1630 by the Plymouth Colony and this functioned for five years. Both French and English sought the trade in furs and much bad feeling must have resulted. By the treaty of Breda between the English and French in 1667, Nova Scotia was ceded to the French and in February of the following year, the whole of Acadia also, including Penobscot (Pentagoet), which is specifically mentioned. It was about this time that Baron Jean Vincent de Castin (also called Sieur de Badie) arrived and settled here. Later a residence and fort was built by Baron Castin on the site which now bears his name. A devout Catholic, he erected a chapel in the fort. He married a daughter of the Tarratine Indian chief, and by this union there was a son named Anselm, who later succeeded to his father's position and influence. Wisdom and restraint seems to have marked Baron Castin's relations with the Indians, by whom he was highly esteemed. The trade in beaver and other furs must have been extremely profitable and seems to have been the cause for the attacks upon the place.† In 1674, both the English and the Dutch made raids. In 1676 a Dutch man-of-war seized the fort and held it until vessels from Boston drove the Dutch from the peninsula. For the next ten years, we are told, there was a peaceful interval. The territory between the Penobscot and the St. Croix seems to have been subjected to repeated claims and counter-claims during these years, and in 1688 we find Sir Edmund Andros, Governor of New England, at Castine. Baron Castin, believing that his capture was the objective of the visit, withdrew to the mainland, whereupon the arms of the fort and even some of the furniture were seized and a message left that his property would be returned if he would render allegiance to the English King. In 1690, Sir William Phips, who had been sent by Massachusetts to subdue Nova Scotia, took posse- ssion of the intervening coast. Seeing the trend affairs were taking, Castin gave in his adherence to the English (about 1693, according to Willis), and thereafter, despite criticism from the French, seems to have marketed his furs by way of Massachusetts. In 1701 Castin left for France, where he died in 1703, or later. We learn of an expedition in 1704 during which Col. Benjamin Church captured many French and Indians, including a daughter and grandchildren of Baron Castin. In making deductions from the evidence permitted by the coins that we have in hand, it must be remembered that we should have been on safer ground had the entire deposit been available. It is only when a hoard can be studied as a whole that the best results are obtainable. With the Castine coins, we are fortunate that a careful examination of the whole was permitted at the time of discovery. The selection made by Dr. Stevens seems to be what he claimed—a choice of the best preserved specimen of each variety recognized by him. We have noted that there are two pieces (Nos. 24 and 26) which must be rejected. We have also noted that one of the pieces in the lot of seven presented by Mr. Williamson (No. 25) must also be eliminated. It is possible that this should also be the fate of No. 23, but the inclusion or the exclusion of this piece does not radically affect our consideration of the deposit. This coin is a twelve marien-groschen of 1671 struck for Johann Friederich of the house of Lüneburg (Celle) in Hanover—one of the German states not far removed geographically from West Friesland and Gelderland, represented by the coins numbered 18 and 19. How did this piece escape the attention of Dr. Stevens if it was among the coins of the deposit examined by him? Both Williamson's and Stevens' accounts of the finding of the deposit state that the French coins formed about one-half of the total. This is noteworthy because the French in Canada were never plentifully supplied with hard cash. Whence could so heavy a proportion have come? Did Baron Castin have means of obtaining French silver from the homeland not possessed by other colonists? Or could he have obtained French coins from the Massachusetts buyers of furs who might in turn have gotten them as a result of their West Indies trade—indirectly rather than directly from Martinique, since for most of the reign of Louis XIV, France and England were at war and direct trade therefore improbable. New England skippers would not have been slow to realise that French coins would be welcome at Castine. A further possibility would have been the pirates—a consideration of their having any connection with the deposit must be deferred for the moment. Dr. Stevens' account places the Spanish issues, which are lumped as 'cob' dollars, second as to numerical representation in the deposit—Mr. Williamson who mentions the Pine Tree issues as second, says the 'cobs' came next. Of this group there are preserved for us four of the eight-real pieces in the original Stevens selection (Nos. 12 to 15), plus two and one real pieces (Nos. 16 and 17). In the supplementary gift of Mr. Williamson there are two additional pieces-of-eight (Nos. 10 and 11), while No. 20, as we shall see, is in a class by itself. 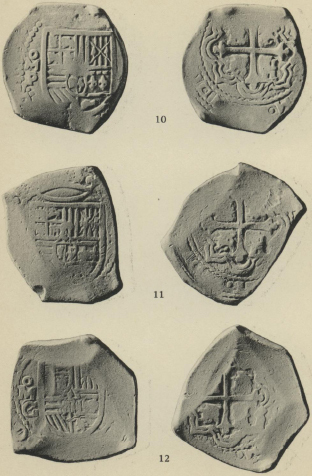 The designation "cob dollars" was loosely used for these irregularly shaped pieces, but it does not seem to have become general until after 1700. When the Spanish "milled dollars" came into circulation they were given preference over the "cobs" as collectors of the Continental notes of the Revolutionary period will recall. In John Hull's account books, preserved in the Library of the New England Historic Genealogical Society, reference is usually to "pieces-of-eight." Although we have frequent mention of 'Seville dollars' in the records, none of the Castine coins that have come down to us are from that mint. The single Spanish issue is from the Segovia mint (No. 20), but it bears a countermark which places it in another category. Here, however, it is noteworthy for its excellence of workmanship, comparing favorably with the French coins in that regard. Fortunately for us, Dr. Stevens' selection was an observing one. Three pieces-of-eight and a one-real piece are from Mexico. One piece-of-eight and a two-real piece are from the Potosi mint, in what is now Bolivia and was then Peru. One piece-of-eight is from the mint at Lima, and another from a mint in what is now Colombia—Santa Fé de Bogotá. Most of these coins are, we have noted, irregular in shape and imperfectly struck. The flans have seldom been reduced to anything approaching flatness, and as a consequence, the types are only occasionally complete and frequently the flans have received so weak an impression that certainty of identification is extremely difficult. The 'Peruvians' were in disfavor because an issue of about 1650 was not up to standard in purity, and this condition led to counterstamping with a 'Golden Fleece' in Antwerp to permit their circulating in the Low Countries when pieces were of good weight. Charges that these coins were clipped excessively do not seem to be borne out by the specimens in the Castine deposit—although their appearance would bear out this charge, the scales do not. We must remember, however, that clipped pieces would have been put back in circulation rather than added to the contents of a hoard such as this. The Mexican pieces in the deposit offer little of distinction. In addition to being imperfectly struck, they are worn, and save for the possibility that No. 12 might have been struck as late as 1700, are unimportant. Nor are the two coins of Potosi of exceptional interest. It would have been helpful if we could have learned the mint-origin for all of the pieces which were melted; for information such as this we shall have to await the discovery of another deposit. Concerning the Pine Tree pieces in the deposit, we have already noted a contrast between the estimate of Mr. Williamson as compared with that of Dr. Stevens. The four examples in our catalogue do not include any of the types which preceded the Pine Tree type and this tends to confirm Crosby in his placing the Willow and Oak as the earlier forms. There is also confirmation of his placing the small-flan issues as later than the broader Pine Trees which match the Oak Tree coins in diameter. Their weight shows but slight deviation from the norm of 72 grains, for No. 6 is of full weight, No. 8 weighs 69 and No. 9, 68½ grains, while the sixpence weighs 33 grains. With the exception of Nos. 4 and 17, these are the lowest-value denominations in the deposit. If Mr. Williamson's statement that there were nearly as many sixpences as shillings is correct, we have a striking demonstration of the demand for the smaller piece in trade. We should have been grateful for a chance to examine the coins melted to see whether there were signs of clipping among these Pine Tree issues. The degree of wear might also have permitted some deductions of value, for it is entirely possible that some pieces which were worn showed so little of their type that their classification as being all Pine Tree varieties may be erroneous. No. 21 is a Portuguese coin called a tostão—a parallel with the Italian issue called 'testone', and so named because of the head which occupied the obverse, but which on the Portuguese form is replaced by the coat-of-arms. Our piece was struck at the Oporto mint during the reign of João IV (1641–1656). It weighs 86½ grains and is therefore worth but a little more than a New England shilling (72 grains) and closely approximates the English shilling. No. 28 is a four-real piece originally struck in Spain at the Segovia mint in 1659. It bears a countermark, however, which indicates that its circulation value has been raised to 300 reis, and the consensus of opinion now is that this counterstriking was done in Brazil †. This increase in value took place under a law passed in 1663—the original value of the four-real piece being 240 reis. The piece shows but slight signs of wear. Countermarking such as is shown on this piece established the value at which the coins of Spain or of the Spanish mints in the New World would be accepted in the Portuguese colony. It would seem to demonstrate that in Brazil as in New England, the Spanish coins were current because the mother country could not meet the needs of the colony for small change. Such countermarking could be done easily in the colony even though no mint had as yet been established there. The accepted date for the first Brazilian mint is 1695. It was not until after 1700 that the Portuguese gold began to supersede the Spanish gold coins in the confidence of the English and Americans. No. 18 is a 3–gulden piece struck for the Dutch province of West Friesland in 1682. In size, this matched the ducaton, or 'rider', for which it seems to have been mistaken in Mr. Williamson's account. Its weight of 481 grains compares with the weight of from 415 to 423 for the Spanish-American pieces-of-eight and 418 grains for the French écu. No. 19 is a Leeuwen-daalder or Lion dollar, struck for Gelderland in 1641, and therefore one of the earliest coins in the deposit. Its weight is 404 grains or slightly under the gross weight of the Spanish-American pieces. Initiated in 1575 by the independent Netherland States, these Lion dollars were later used for the Dutch trade with the Levant. They were widely imitated in Germany, Italy and Denmark and were ultimately supplanted in Levantine commerce by the Maria Theresa thalers and the piasters. They seem to have had considerable popularity in some of the English colonies after 1650—presumably in New York, where the currency of the Hollanders might be expected to have persisted, but also in Pennsylvania and Maryland. Chalmers † states that these dollars "were the chief metallic currency of Maryland in 1701. An Act of December 1708, 'for settling the rates of foreign silver coynes within the Province' speaks of the 'Dogg' dollars as the 'only generali coyne among Us.' They were to pass as 4s. 6d." "There is now in these Plantations a great quantity of Spanish money Plate and Bullion and would be much more if returns were answerable; which money Plate and Bullion is of no use to the Inhabitants to make returns to England because of the uncertain value putt upon it there, and a piece of Eight in the Bahamy Islands being about five shillings the same in Carolina, in Maryland and Virginia four shillings and sixpence, in Pennsylvania Seven shillings, in New York and New England six shillings and sixpence, but frequently rising and falling in value by the Contrivance of some designing men in those Countryes who engross it when att the lowest and soe make Merchandize of it and export it into foreign parts where it is more value than in England." The part played in the affairs of the New World at this time by pirates and privateers was so considerable that we must take into account the possibility that the Castine deposit was made by one or more adventurers, before accepting any other reason for its burial. The line between pirate and privateer was often all but indistinguishable—there is on record the defense of one doughty captain that he did not know that peace had been signed at the time he captured the vessel he claimed as prize. Since the intervals of peace between England and France from 1650 to 1700 were brief, and since Spain and Holland were also at war with England during some of these years, attacking the enemy's shipping was an easy and profitable means of improving the fortunes of the merchant-sailors of New England. The building and equipping of vessels, which steadily increased in size, received strong encouragement from the success of such ventures. Even recognized pirates were granted entrance to certain colonial ports where their willingness and ability to put hard cash into circulation won for them a welcome which did not escape the condemnation of the right-thinking element of the citizenry. One of the chief objections to thinking the Castine coins the belongings of a pirate or privateersman is to be found in the composition of the deposit and the fact that it was secreted along the line of retreat from the town after 1690 (the date of coin No. 5); that is, following a seaward attack upon the fort. Secondly, a preponderance of French coins seems unlikely for a privateersman since we know that the sending of hard cash to Canada in quantity was never a practice of the French Government. Both Messrs. Williamson and Stevens give a clear-cut expression to their belief that the coins were secreted by someone in Baron Casting entourage, but the former's opinion is colored by the mistake of thinking that the latest dated coin in the hoard was struck in 1688, one of the years in which the Castine peninsula was raided. We have seen that No. 5 is dated 1690 and have noted that additional time must be allowed for the coin to have crossed the Atlantic. It has also been noted that Baron Castin left the Maine coast in 1701 and that he died in France in 1703, or later. If the coins in the deposit had been part of the money-chest of the trading post, and if they had been buried before the Baron left Castine, we must find some explanation for their not having been unearthed or reclaimed after the danger which had caused their burial had passed—a condition the more unlikely because their hiding-place might easily have been described to someone who did not know their whereabouts. Wheeler's History of Castine states that "In 1701, Baron Castin left for France, taking with him two or three thousand crowns in 'good dry gold'. It is probable that he never returned to America, although it is not unlikely that he intended to do so." Carrying such a sum in gold is easily to be understood because of the lesser bulk as compared with silver, and also because of the dearth of silver in the colonies. We may suspect that the weight of these silver coins played a determining part in the decision to hide them near the rock on the shore of the Bagaduce, and this supports the idea that the concealment was in the course of flying from danger at the fort or in the town. The weight of this excess baggage would have proved an impediment and hiding it in a spot to which future return was easy was an admirable solution, comprehensible under the circumstances. In May of 1704 during Queen Anne's War, Col. Benjamin Church commanded an expedition along the eastern coast. He captured many French and Indians, among whom were Baron Castin's daughter and her children. It seems that the flight from an attack such as this best accounts for the conditions which surround the burial. The heavy preponderance of French coins could be explained because they would be more acceptable among those to whose protection the fleeing traders were turning. The number of persons to whom the hiding place was known must have been small, but the fact that the coins remained here without the owner returning for them is indication that the secret of their burial was well kept—probably for the reason that death, and very likely sudden death, intervened before there was an opportunity for reclaiming them. This would explain why the place of concealment was not revealed to some friend or retainer of the owner in order to regain the treasure—if the whole had belonged to the Baron or someone in his employ, it is hard to find a reason why this was not done. It therefore seems that agreement with Messrs. Williamson and Stevens is to be preferred to thinking the deposit made by pirates, although the date accepted by them must be revised in favor of a later one. The year 1704 seems best to meet the complicated circumstances recorded. It is profitable to analyze the conditions which brought these coins to this sheltered Maine port at such an early date. The trade with the Indians was chiefly in beaver skins and other furs. Payment for them would not have been made in silver, which had slight appeal to the Indians. Steel implements, such as knives and axes, trinkets and whiskey were articles of barter in which they were interested. After Baron Castin "gave in his adherence to the English" in 1693, he must have received such coins as the Pine Tree shillings, those from the Spanish colonies, and the English pieces, from this source, in payment for furs. Although the French coins might also have come by way of Massachusetts, they are more likely to have been received from the French of Acadia in return for materials which the Baron could obtain more easily than they. The Peruvian pieces from Lima and Potosí must have made their way up the west coast to the Isthmus of Panama, and after making the crossing, reached some island of the West Indies at which the New England skippers touched—most likely the Barbadoes but possibly Jamaica. Similarly, the Mexican pieces-of-eight must have voyaged to the same or other islands unless a watchful privateer or a pirate had changed their destination. We have seen that these Spanish colonial issues were welcome in Massachusetts because of the scarcity of coins there. We also know that salted codfish, a staple and profitable export of the early New Englanders, were eagerly bought in the West Indies. If the New England captains did not find a desirable cargo permitting their direct return, they frequently loaded with merchandise salable in England, and there obtained goods needed at home. There was direct traffic between the English colonies and the Azores and Madeira and this would have brought them into contact with Portuguese and Spanish markets in which their cargoes of codfish were exchanged for wines. In such transactions a relatively few Portuguese coins and a more considerable number of pieces-of-eight may have reached Boston or some other New England port, and would in turn, for lack of other currency, have been carried to Castine to be exchanged for furs. The Dutch pieces may have been left there as a result of the occupation of the Dutch man-of-war in 1676, although there is nothing to prevent their having come as the result of an effort on the part of the Dutch to outbid their competitors for the furs which were Baron Castin's chief source of wealth. They might also have come indirectly by way of the Bay Colony. Finds of coins within the present territory of the United States have not been frequent, although they are more numerous than might be supposed. A fairly considerable number of records of such hoards may be consulted in the Library of the American Numismatic Society—in almost every case, the record is inadequate, and as a general rule, none have been properly described or studied. Another hoard was found in Maine, at Richmond's Island in 1855, not far from the site of the Castine deposit. It was composed entirely of English coins, twenty-one of gold and thirty-one of silver, and is thought to have been buried about 1645.† Another interesting hoard was found at New Windsor, N. Y. It consisted of about six hundred and fifty 'Spanish dollars' of which some 'bore date as early as 1621'. An English 'crown' (?) was dated 1768, and the latest piece was said to have been 1773. There were, in addition, a French coin of 1734 and a Spanish gold medal. Most of the coins were sold. Hoards of Pine Tree coins have been found at Roxbury, Mass. and at Exeter, N. H., but the records of the finds are very inadequate. Some finds have been made in Florida and the Carolinas within recent years. Since almost every hoard is a law unto itself, it behooves us to ask whether the Castine deposit has any peculiarities which should be noted. It seems strange that one of the most significant of American hoards should have been unearthed at the northernmost point at which we could expect to find it. 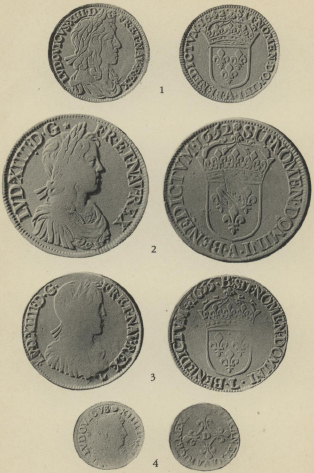 After discounting the significance of the heavy preponderance of French coins as due to the proximity to French territory, to the French sympathies and forbears of Baron Castin, and to the close rapprochement of the French with the Indians, we have, as a result of these coins having been buried, an extraordinary and illuminating indication of the currency at the time this money was concealed, not for Castine alone but for New England. It is significant that there were no gold coins; this circumstance supports the contention that it is unlikely to have beeen a pirate's property. From it, we might also deduce that it is less likely to have been the money-chest of Baron Castin or of his rep- resentative, and more probably that it was the property of some humbler retainer or hanger-on. We also receive from these coins a clear indication of the importance of the Spanish-American coinage in the colonial currency, and of the circumstance that these pieces-of-eight came from all four of the Latin American mints. So far as the pieces contained in the hoard are concerned, they afford no evidence of the clipping which the colonial records bespeak so frequently, and this suggests the possibility that the appearance may have been accepted for the fact, and that the complaints regarding their having been clipped were exaggerated, perhaps deliberately, for the purpose of condoning the issue of the Pine Tree coins. Another condition, which our plates bring out markedly, is the superior workmanship of the coins of France and of the Low Countries, as well as those of the Spanish mint at Segovia. This is true of the Seville mint also, although we do not know that there were any Seville pieces in the deposit. We know that discontinuance of the hammered coins in England took place in 1662. It is these hammered pieces which were taken for his pattern by John Hull in making the Massachusetts issues and the weight of these Massachusetts coins is an indication of the need for denominations smaller than the pieces-of-eight. The constriction of the flan and its thickening which took place toward the end of the Pine Tree coinage, shows the growing tendency in this direction—a change which had already taken place in England and on the European Continent. Lastly, the presence of the Portuguese and Brazilian coins serves as an indication of the growing commerce of the New England shipmasters—something which might have had further demonstration if it had been possible for us to study the section of the deposit which was melted. If the finders of similar hoards can be convinced that their holdings are likely to have an increased value when kept intact, it may result in such findings being preserved so that they can be given study to bring out whatever of historical value they may contain. Pradeau, Num. Hist. of Mexico, p. 45. Smith's Journal in Coll. Mass. Hist. Soc., III, 21, 3rd series. Williamson (loc. cit., p. 111), cites a statement by Baron Castin in 1695 that the volume of the fur trade at this post was eighty thousand livres annually. Whether this means that the profits are represented by this sum or that it is the selling price of the furs in Europe, is open to question. For a lengthy discussion of the records regarding the brief reopening of the Lima Mint in 1658, cf. Medina, Las Monedas Hispano-Americanos, pp. 160 ff., and an abbreviated summary in Cat. Coll. of Julius Guttag, p. 432. See the article by Dr. Edgar de Araujo Romero in Annaes Primeiro Congresso de Numismatica Brasileira, Vol. 1, p. 409. Chalmers, Colonial Currency, p. 12. George Francis Dow and John Henry Edmonds. The Pirates of the New England Coast, 1630–1730. Salem, 1923. Cf. entry in John Hull's Letter-Book preserved in the Library of the American Antiquarian Society at Worcester, Mass. Cf. Coll. of the Maine Historical Society, Vol. VI, pp. 127 ff. Mr. Williamson proceeds with the descriptions and a statement of the number of coins found and concludes with his explanation of the occasion for their burial.